Without question, beer and meat are always a good match! And if like us, you're a lover of beer and meat, you will have a very good time in the imperial city of St Petersburg. People drinking and eating at a local pub restaurant in St Petersburg Russia. 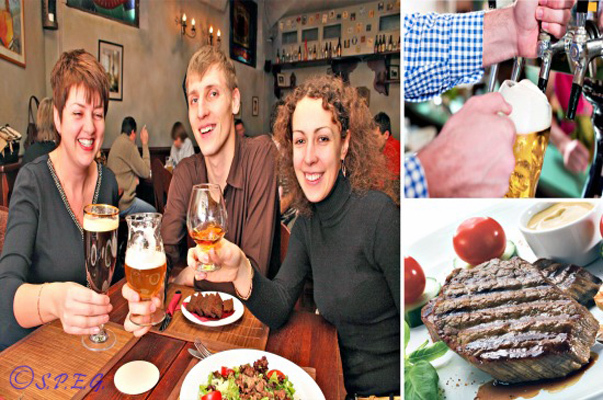 Because Russia is well known for being a meat eater's paradise and beer is now more popular than ever, though many Russians still love drinking vodka and wine when at a restaurant. So if you are on a trip to St Petersburg Russia and want to taste a medium rare or rosette steak cooked on the grill along with a good pint of a local beer (Nevskoe, Baltika, Bochkarev) or international beer (Heineken, Leffe, Guinness), you will find a lot of good beer restaurants and steakhouses to satisfy your palate. But before you go, make sure you take note of some of the best places to eat out! Tip: If you like to have your steak medium rare or rosette, make sure to ask specifically for it when ordering your meal. Russians seem to like their meat medium to well done! Also, as usual don't forget to book a table in advance. Luxurious interior, Belgian beer, European cuisine! At Brasserie de Metropole, no expense has been spared in turning this restaurant into a luxurious reminder of 18th century St Petersburg grandeur; beautiful shades, transparent skylights and stucco as well as Flemish painting replicas. As the only Russian restaurant with a Belgian brewery, you will enjoy special brews representing the beer traditions of that country. Meanwhile, dig into Chef Eric Thor’s extensive menu which combines European, Belgian and Russian dishes and creates culinary delights. If you are a sports lover, head to the Belgian pub; but if you want a more intimate environment, check out the candlelit column hall instead. German beer hall, Russian fishing, Meat mania! If you find yourself on Krestovsky Island, you won’t miss Karl and Friedrich, a classic German beer restaurant reproduced in the heart of Saint Petersburg. Playing on the German love of beer and sausages, you can enjoy its four specially brewed German beers while sampling bratwurst and knuckle Munich sausages with up to 1,000 other guests in their garden. To complete the experience, you can enjoy dancing and live music or try your hand at classic Russian ice fishing on the river in winter. Take the children to Cheburashka Zoo nearby, which is home to many adorable farm animals. Home brewed beer, Classic dining out, Weekend parties! You may know Russia for its signature vodka, but the imperial city of St Petersburg has its share of authentic beer restaurants that pair local brews with light and fine Russian cuisine, like Munhell. Everyone will feel comfortable at Munhell, where you can dine in a warm library setting with friends over a game of chess and cigars. Here you can even enjoy a candlelit dinner with food like duck confit, beef carpaccio and mussels in white wine. With the brewery nearby, Munhell only serves the freshest beer, which you can enjoy as you dance away to jazz, rock and even romantic music. Czech pub, Central European cuisine, Formal dining! Marius pub stands out from other beer restaurants and steakhouses in the Imperial City of St Petersburg, because it is a Czech-inspired pub, not German, Irish or British-themed. You can expect to have a nice meal here away from the distractions of the city, as it is attached to a hotel and has an intimate atmosphere different to other such bars. Due to its Central European theme, you can expect lots of sausages and goulash, as well as steaks. Nevertheless, you can also sample classic Russian dishes like Pancakes "Menshikov" with veal and mushroom, beef stroganoff and Russian dumplings with sour cream. Golden wheat brews, Crispy pub food, Extensive wine menu! Beer restaurant Bierstube offers the quintessential German fare set in a cozy brasserie where you can enjoy a quiet home brew in peace. You can explore the solid wood brewery and relish the quality wheats, Czech Bright, Dark Irish beer or red beer. Add its mouth-watering pub dishes to your palate, and dig into pub favourites like cheese sticks with tartar sauce, smoked pork ribs, and flavourful crispy pork knuckles. Do not miss Bierstube’s very own golden wheat beer and the extensive wine list, which you can pair with classic European cuisine. Classic German food, German beer, Rich seafood! You will enjoy Paulaner's rich menu if you loves meat-laden dishes with your beers. Start off with the spicy cheese spread and spiced lard entrée before trying the whopping large starter in true Bavarian tradition: pork collar, meat loaf, ham, salami, smoked bacon, spicy cheese spread, onions, gherkins, lettuce, tomatoes, horseradish, radish and butter. Even the seafood is a mouthful, like the smoked salmon and butterfish. Besides the Paulaner beer, there is Swedish and Russian vodka on offer as well as classic Russian cuisine like clear traditional Russian fish both served with “rasstegay” (fish pie). See also another Paulaner at Park Inn Pulkovskaya at the Ploshad Pobedy 1 (Metro Moskovskaya). Best beef Stroganoff, Rich in history, Great steaks! A testament to its tourist pull, Stroganoff Steak House gained Trip Advisor’s certificate of excellence in 2012 and 2014. If you are a history buff craving a look at old Russia, you’ll love Stroganoff – the first Russian-American Steak House - as it showcases pre-revolution Russia in a 19th century St Petersburg country house. You have over 15 steaks to choose from, and many beers and wines to pair them with. Trained staff will keep your kids entertained with cooking classes while you take in the authentic décor. Definitely the best place for a proper steak! Wild Wild West, Tobacco and whiskey, American steaks! If you are craving the American saloon feel, look no further than Montana Steak House, which has two outlets in St Petersburg. While the furniture plays on Native Indian culture, the décor is classic Wild Wild West: wood panels, rifles and saddles hanging from the walls and American westerns and concerts playing on screens. Here, you will relish the taste of whiskey with a variety of steaks and tobacco. For authenticity, watch as Chef Aleksandr Zhidkov cooks your delicious steaks in an authentic American Josper oven. Family friendly, Large dining hall, Great steaks! This cosy studio-like steakhouse in Russia’s Northern Capital is an ideal place for you to meet friends for lunch on the comfy couches or dine on the terrace overlooking Kazan Cathedral while your children frolic in the play area. Another Ginza Project outlet, Ribeye emulates the Texan steakhouse. You can savour the succulent rib-eye steak and grilled salmon courtesy of Ribai’s US-trained chef. Meat is everywhere, even in the salads. Choose from filet mignon, New York striploin, and New Zealand lamb to lip-smacking pork steak with orange-mustard sauce and American beef filet with spicy chocolate sauce. As its name suggests, Ribai is a Russian restaurant for meat-lovers! Worldwide ingredients, Specialty grilled steaks, Majestic view! Set in a cavern like atmosphere, St Petersburg beer restaurant Meat Head is made purely for meat connoisseurs. If you like your steak done a certain way, you will love that Meat Head imports meat from America, Australia, New Zealand and Argentina. Your steak is cooked in a special oven dzhosper, a closed grill where the meat is cooked on charcoal, birch and aspen so the crust is appetizing while the meat remains tender and juicy. You can relish Meat Head’s hand-picked wines while enjoying the majestic view of the Church of Savior on the Spilled Blood. The menu also has Hungarian duck, quail and octopus, for some variety. Contemporary décor, Specialty ribs and steaks, House cocktails! Korovabar is the essential steakhouse, where you can choose from a wide variety of burgers, ribs and steaks. Its interior makes for intimate dining, suitable for a romantic dinner or business lunch. Revel in the contemporary art as you sample the house cocktails to go with your main course. While the dim lighting and snazzy design will make you feel like you are in a club, its fine dining menu gives off a high-class feel, perfect for those who want a quiet meal after a day of touring the Imperial City. Wide choice of steaks, Value for money, American steakhouse! Built like the quintessential American steakhouse, Saint Petersburg beer restaurant Steak Club is exactly what its name suggests. You will be spoilt for choice, with over 20 different types of steaks, all in super large servings and affordably priced too. The cosy atmosphere and warm wooden panelling is perfect if you are on a day out with friends or family. Big groups will enjoy the large servings and wide assortment of side dishes. Many locals and tourists alike have said Steak Club offers the best steaks in the Venice of the North.